The great thing about this recipe is that you can add or remove any ingredients to suit your tastes. Try adding some fresh prawns from the fishmongers in-store for some variety. Boil the sweet potatoes in a medium saucepan until tender and cooked through. Drain and put back in the saucepan. Add the butter and a pinch of nutmeg and mash until smooth. Set aside. Place the carrot, celery, courgette, chilli and grated cheddar in a circular casserole dish. Scatter over the chopped tomatoes, spinach, parsley and lemon juice. Add the fish to the casserole dish and mix all the ingredients well. Season with salt and pepper. 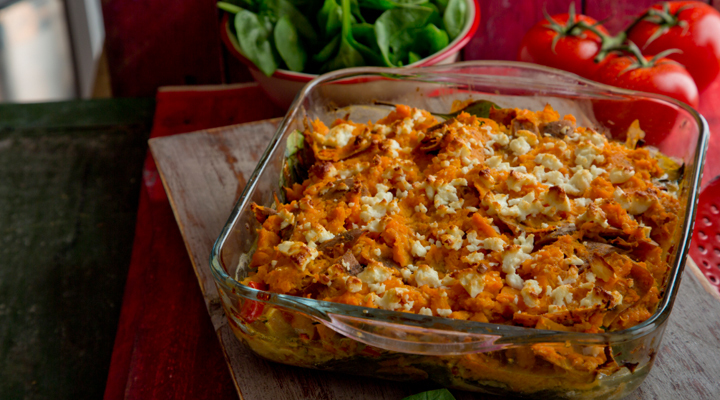 Cover the fish with the mashed sweet potatoes and sprinkle with the crumbled feta cheese. Cook in the oven for 40 minutes, until the sweet potatoes are lightly browned and the fish pie is warmed through. I just made this for dinner and it was amazing, super easy and quick and everyone loved it. Delicious, so tasty especially during the Winter evenings. Light n yet tastes so nourishing. Yum yum!